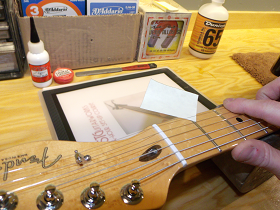 Learn to set-up your own guitars! The 4-Hour Set-Up Course will teach you how to do professional set-ups. This course is a step by step, hands-on walkthrough in guitar set-ups, with a one-to-one student / teacher ratio. You will be shown factors that contribute to a World Class Set-Up, you will be taught efficient ways to measure and adjust and you will use the professional tools of the trade. •Course Booklet (re-iterates subject matter, lists all tools used and includes resources to further your skill). •Course Certificate (potential job reference). •Your guitar set-up just how you want it! The course will focus on Acoustic Steel String, Nylon String, Electric with and without a Tremolo. To bring your own guitar is recommended and to be as familiar as possible with its playing characteristics. Warning: bringing instruments that are in need of extra attention will likely extend the duration of the course past 4 hours, in which case the subsequent rate of $30 per hour will be charged. It is preferred that you have been playing guitar / bass at least three to five years.